Basic Summary: The first traditional hydration pack from Orange Mud, with a 2L HydraPak reservoir and 6L of cargo storage. 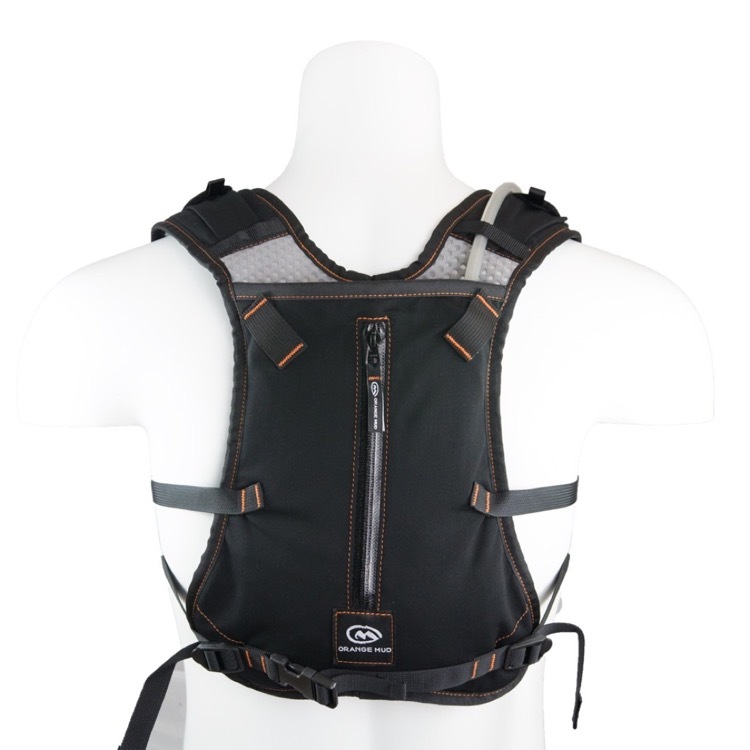 Its fit is different than traditional packs in that the fluid weight sits higher on the back. Front side cargo access is spacious and convenient, and the rear compartments are secure and stable during activity. The Endurance Pack is pleasantly lightweight but has adequate storage options to support full day trail outings. 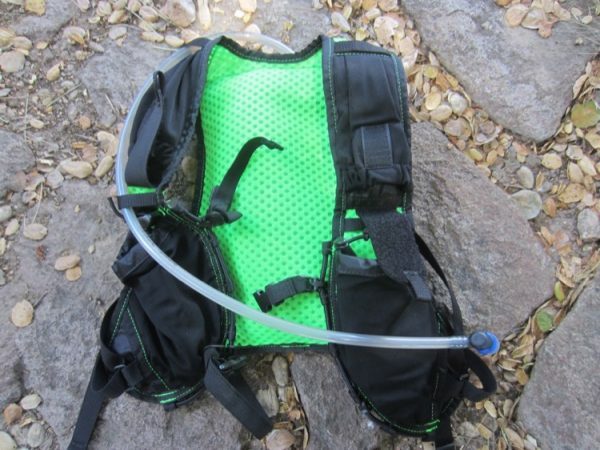 Colorado-based Orange Mud has always been an innovator in the trail gear market, and their first foray into hydration products featured the Hydraquiver packs (Single or Double Barrel versions) that utilized large capacity water bottles across the shoulder blades instead of the traditional fluid reservoir. While that design has a lot of functional advantages, the strap placement (a bit awkward) and cargo capacity (minimal) makes it more of a niche product than a mainstream workhorse. The Endurance Pack has neither of those drawbacks, and provides an outstanding combination of comfort, stability, and function that make it an extremely attractive option for moving efficiently down the trail. It also has good crossover potential for mountain bike use, but our testing was specifically done on long trail runs. The fit of this pack is still slightly unorthodox, as the weight of the reservoir is positioned higher on your back than most hydration vests, but this is easy to get accustomed to. The front straps also rest higher on your chest, which positions the smaller pockets of each strap almost directly on top of your shoulder. The pack conforms to the shape of your torso very effectively, with minimal bouncing even at high speeds. Adjustment on the front of the pack is done through dual sternum straps that are primarily elastic, which presents something of a tradeoff. The elasticity allows the straps to expand smoothly with the chest without being restrictive, but it’s less effective for pulling the straps closer together, or for cinching down the overall pack fit from the front. These front straps are mainly for fine tuning; the primary adjustments happen from two convenient side straps that don’t require wrenching your arm in a weird position to reach them. Once we got the fit dialed in, the Endurance provided one of the most stable rides we’ve felt with a 2L hydration pack. Storage on the front of the pack is spacious and convenient, and the pocket arrangement is the same on each side: a large stretch mesh pocket positioned low with a cinch closure, and a smaller stretch mesh pocket above with waterproof backing and Velcro closure. The lower pockets can accommodate bottles but are great for stashing a ton of food or small items of clothing like hats or gloves. The upper pockets are ideal for pills or electronics, and stretch enough to accommodate a standard size cell phone. All of these pockets are easy to access on the go and hold your belongings very securely. The back side of the pack is broken into three distinct compartments; the first is a bladder compartment that has a secure Velcro loop to keep the reservoir suspended. On the subject of reservoirs, Orange Mud smartly partnered with HydraPak, whose Elite bladder with a detachable drink tube and high volume bite valve is simply the best in the business. 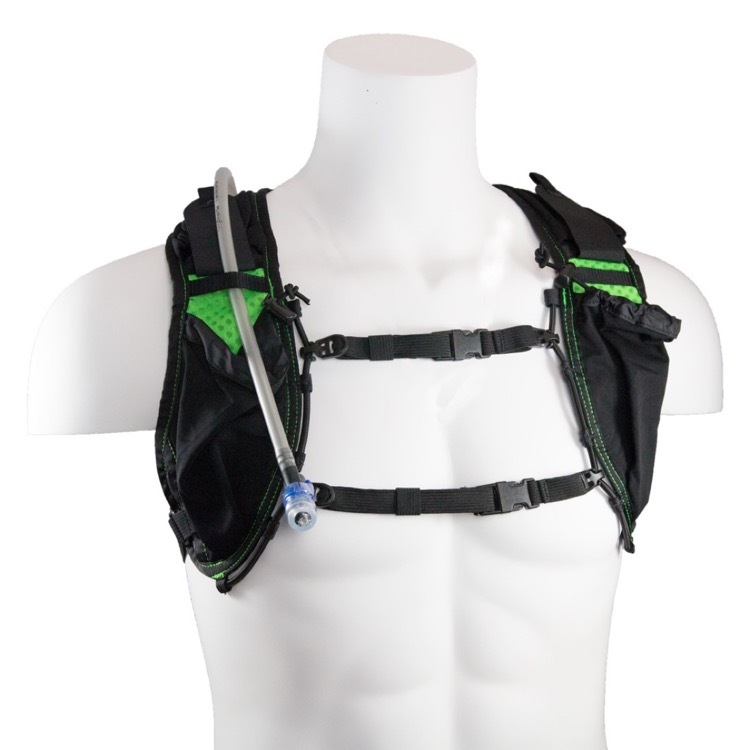 The HydraPak reservoir included with this pack sits very snug inside the sleeve compartment, and the drink tube can be routed over either shoulder. The remaining backside compartments are a large main cargo compartment that is open at the top, and a full length vertical zippered compartment directly above it that is made of a very stretchy abrasion-resistant mesh with impressive room for expansion. This zippered pocket has a key clip on the inside. The optional trekking pole attachments and shock cord attach on top of this zippered compartment; the trekking loops are designed to store poles in a “V” shape, and the shock cord can keep larger belongings like a jacket secure on top of the entire load. Conclusion: Orange Mud’s Endurance pack is simultaneously innovative and simple; it tweaks the traditional shape and fit of hydration vests while providing secure and user friendly storage options on both the front and back. It’s also impressively lightweight, stable and comfortable, and is well suited to be used for both training or race day. Thanks much for the review Donald!